Designed for the garden, the GC-400 Handy Caddy is at home in workshops, garages, or any task that requires working at low levels for extended periods of time. 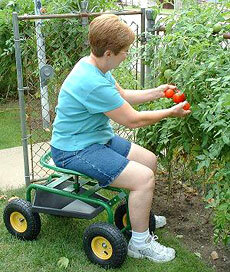 The GC-400 Handy Caddy is a must for any lawn or garden enthusiast living with knee or back pain. 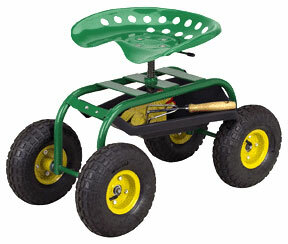 The heavy duty steel frame, big pneumatic tires and swivel tractor seat with adjustable height are designed to let you move around most landscapes while seated. Tools and supplies are held in the handy shelf below the seat. All products from Mid-West Products, Inc. include a one-year guarantee on parts.